Tyrone Ladies manager Gerry Moane. (Photo by Sam Barnes/Sportsfile). Gerry Moane is set for a third season in his second term in charge of the Tyrone Senior ladies after his reappointment alongside an enhanced backroom team was ratified by the county committee. Hugh Donnelly returns as minor boss with Louise Daly in charge of the Under 16s, Pius Fox taking the under 14s, all management teams have been confirmed for two years. Moane, who guided the senior team to a first All Ireland Intermediate final in September had indicated all along that the campaign that culminated in a narrow loss to Tipperary at Croke Park was really just the first phase of what he described as a long term plan. He had taken the reins just ahead of the 2016 season but had little time for preparation and felt 2017 was really his first full campaign. Common sense then would have dictated that this appointment was a mere formality such was the progression made over the previous 12 months. 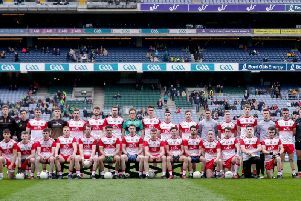 Quality strength and conditioning, professional development and a step up in all aspects of preparation brought Tyrone close to league promotion, back-to-back Ulster titles and that Croke Park appearance. Overall the underage management teams had the added boost this year of having their players go through six sessions under the auspices of the new ladies academy with top quality coaching and player development. Progression has been excellent and now with their management teams in place, the players will be focused on hitting the championship trail in the Spring in top shape. Under 13, 15 and 17 Academy squads meanwhile will be selected in January. Senior Team Management: Gerry Moane, Barry Grimes, Sarah Connolly, Liam Swift, Damien Corrigan, Conal Sherdian, Paddy Hunter, Shannon Tracey.